BS10008 more than a scanning solution! Home/Blog/BS10008 more than a scanning solution! Last month DataSpace’s Operations Director Frank Butcher and Quality Manager Kelli Isherwood were invited to give a presentation to the North West Regions NHS Trust Records Manager meeting. The presentation highlighted the importance of BS10008 and discussed the requirements for BS10008 compliance. BS10008 is of key importance within the current Records Management sphere due to the high volume of data being digitised in a forever technologically advancing world. BS10008 is the British Standard that outlines the best practice for the management, transferal and storage of electronic data and for Evidential Weight and Legal Admissibility of Electronic Information. For the attendees of the BS10008 Presentation a Prize Draw was held and entrants had the chance to win a brand new ‘Kindle paperwhite’ and on Monday 3rd February we pulled the lucky winners name out of the DataSpace hat! The winner of DataSpace’s ‘Kindle paperwhite’ Prize Draw is……. Tom Walker, Records Manager at Pennine Care NHS Foundation Trust – Trafford Division! 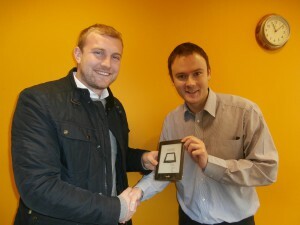 Our Business Manager Andrew Butcher went to deliver Tom’s new Kindle to him this morning, and Tom was over the moon! He said he hadn’t won anything before, congratulations Tom we all hope you really enjoy the Kindle!